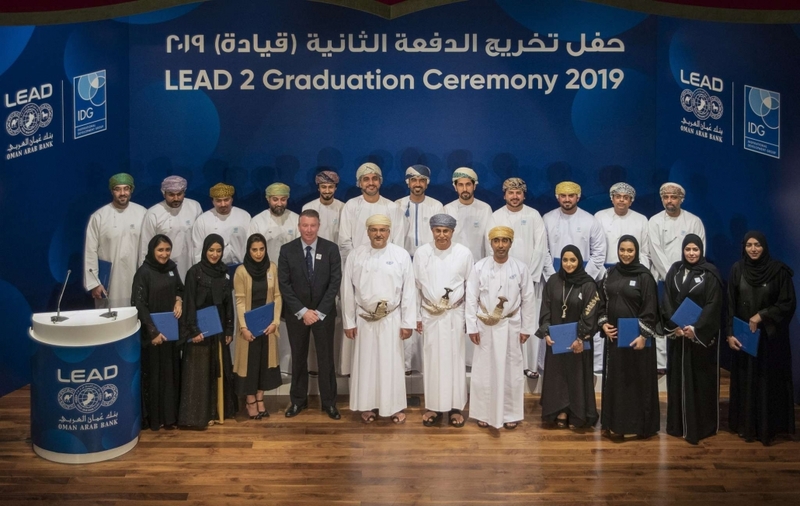 Muscat, March 17, 2019: In its latest step towards the development of its Omani staff, Oman Arab Bank (OAB) recently organised a special ceremony to celebrate the graduation of the second batch of employees who have now successfully completed the Leadership Enhancement and Development program (LEAD). The ceremony was held under the patronage of H E Hamad bin Khamis al Amri, Undersecretary for Labour Affairs in the Ministry of Manpower, and was overseen by Rashad Al Musafir, the CEO of the Bank, together with several members of the executive management and senior staff of the Bank. The ceremony, organised at Bait Al Zubair, witnessed the handing over of graduation certificates to each of the 20 ‘LEAD 2’ candidates. The LEAD 2 graduation ceremony also witnessed the introduction of its new LEAD 3 candidates. The 20 candidates included staff from across various departments of the Bank and had already begun training on the first workshops of the program in February. In the coming months, they will be provided with opportunities to interact with some of the best and most experienced leadership development experts in the industry, ensuring career development and growth for years to come. The Human Resources Division conducts an annual online 360-degree evaluation of the leadership capabilities of its employees across all departments of the Bank in order to select potential candidates for the program. This program aims to build a team of highly qualified staff as part of the Bank’s management and at the same time contribute towards the development of human capital within the Sultanate as a whole.